"Blazing a trail of colour and mediocrity "
Developers Supergonk have managed to create a title that leading up to it’s impending release, seemed to tick all the right boxes when it came to both creativity and fun. Mixing a unique blend of racing, whilst also weaving in little extras that games like Splatoon would be proud of. 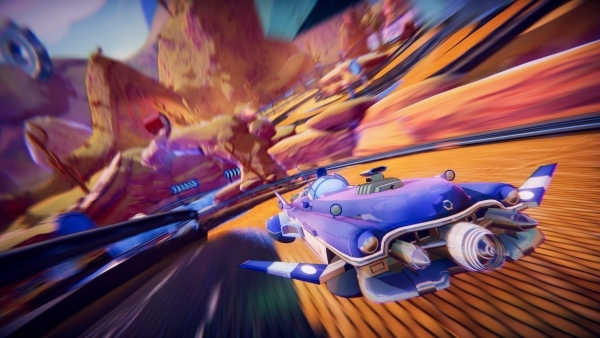 We end up getting a racing title like no other ever released in the form of Trailblazers, but with this experimental mixture of genres building the core fundamental of the game. We have to ask, do Supergonk manage to make the game as fun as it looked through the various trailers and content released before launch? The basic concept of Trailblazers is a very simple one, take the racing genre and flip it on it’s head by making team work a necessity instead of a winner take all affair. 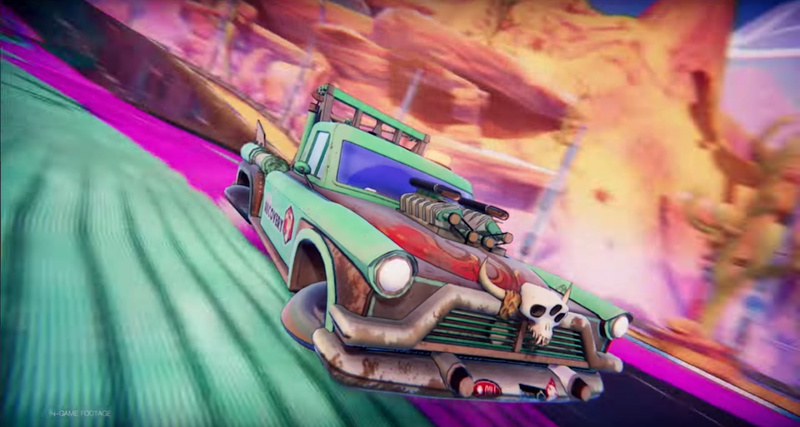 To achieve this take a beloved mechanic from another game and tweak the idea to match a ruleset a racing game can abide too, in this case be it if you paint a track in your team colour you and your team members can boost on it for free until somebody paints over it. The idea is a really interesting one and indeed does work really well, you will quickly learn within a few minutes that the game is very much pick up and play. However after about an hour of play time you also get the dreaded thought that, whilst you can indeed learn the basic game play. It is going to take many, many hours of trial and error to fully master each of the games characters and courses on offer. Whilst you can indeed paint the track that allows you to boost along it, if you are painting the track you are not allowed to paint temporarily until you either decide to stop painting or just plain run out of paint in your meter anyway. This can become a mechanic that can become hard to get used too, as you obviously want to help you and your team as much as possible by taking out other team colours, but by doing so you also hinder yourself in the long run. If you do decide to paint the track, then as I pointed out before you can only paint the track for a short while before you then need to let your tank recharge with paint again, this varies dependant on which character you decided to use based off of their initial skills before you started the race. But one major gripe I had with this mechanic was that, if you accidentally hit the paint button and then let go, you had to wait for the recharge timer to hit full again before you could use it again. This means that you get punished for using a second of paint compared to using a whole tanks worth of the stuff. If you don’t feel like painting the track is for you however and that your team can cope on their own, you can use a paint attack which you can aim at opposing team members. By unleashing this the track in front of you will be painted with your colour, and if the opponent just so happens to be driving in that spot as it gets painted he will get spun out of control for a couple of seconds before then whizzing off again, but hopefully giving you enough time to catch him and overtake. I did find that sometimes when you hit somebody with an attack and then tried to overtake, many times I would just plow into them instead, as it seems they always spin out right in front of your vehicle and thus very quick reactions are needed to stop pushing them needlessly back to recovery again. Apart from this though the racing is pretty right, and considering the cars you drive are from the future and handle more like vehicles from Wipeout seeing as they are all hover vehicles, the handling is actually handled quite well too, at no point when you are turning a corner will you feel like you are about to lose control, however colliding with an opponent or obstruction can leave you getting left behind the pack by a few seconds whilst you try to sort yourself out again. The whole game can be played in both local co-op and online multiplayer, however I did find that even if you play online with a friend, you cannot be on the same team as them which for me made this seem like more of a dud choice. There was no option to select which teams you wanted to be on, as me and my partner at the time wanted to team up to take out the AI but we couldn’t figure out a way to do this. We did find it fun playing races online against each other though getting AI team mates and opponents to help fill out the track a little more, so your not alone can be fun but sometimes you will feel like the AI is racing a whole lot better than you are. Lastly we have the games career mode though which unfortunately is single player only, which again surprised me as for a game that got touted as being an experience best served with friends, I would have thought having an option to play the career with a friend would have been a good choice, I know that some of the races are intended for single player only, but these could have been swapped out for other variants of one of the several modes available in game that offer team play. The career mode is quite lengthy and each chapter and race within the mode will offer objective targets to meet in order to get medals, you need to obtain at least one of these per race in order to move forward however, and sometimes when the AI can seemingly cheat and make it a little harder for you to win, you may find yourself having to replay races time and time again. So whilst the gameplay itself can be quite fun, I did find it was only really fun in small doses, after the novelty of the title had worn off I found that you really can experience everything this game has to offer in under an hour which is a shame really. I thought more modes would have been good to help with the team racing mechanic and having more shortcuts hidden away on the tracks giving good advantages to the player could have helped improve the overall experience of the title. So whilst the game does a great job with presentations and graphical prowess, it seemingly severely drops the ball in the sound design. The issues seem to start with the fact that the title only uses from my memory about three tracks which all loop around and in the end they all kind of seem to blend into just one track which was maybe fun to listen to the first couple of times, but after you have spent more than an hour playing the title, you will be reaching for the remote control to turn the volume down or play your own music through the Xbox console instead. During the story mode too, the characters do not talk to each other either, instead you are just left to read what is included in each of the characters speech sections to read what is going on in the story next. Just like a humph or groan noise every now and then wouldn’t of gone a miss. I understand that some of these titles are built on super tight budgets, so hiring voice actors to do voice work may not be the most feasible way of spending the titles funding, but adding in just slight vocal cues would make it seem a little better. Lastly the engines from the cars all seemingly sound the same, and whilst the game features no pick ups so to speak, there isn’t a whole lot of sound to be heard during the racing apart from one of the limited amount of songs playing during the background of each race, slightly toned down so you can hear the noises of the engines instead. However we do get some noises when you splash your paint over the track or launch your paint attack at another vehicle thus temporarily taking them out for a couple of seconds. Graphically this game stands out as one of the brightest and vibrant racing games to come to Xbox One during this whole generation. Everything from the car design to the characters that ride along inside them all look well rendered. The tracks themselves also feature a fair bit of detail, whilst the track design might not be the most imaginative to ever be created, the cityscape backgrounds to some tracks add that extra depth of immersion, and there is nothing quite like driving by a bunch of cheering fans as you cross over the podium in first place, or limp home in last. Lastly the games presentation even resembles a triple A budgeted game, everything from the press start screen to the menu design and dialogue that comes on in the short cutscenes between races in the career mode. It is all well animated and nothing looks out of place. You can see a whole lot of time has been spent on perfecting a certain look and style for this title and maybe this is where most of the time was spent whilst in development perhaps? With racing titles, they always seem to strike an impossible balance of making the game far too easy to the point you leave the other AI racers behind with tight turns and late breaking, and not to mention taking shortcuts wherever possible. But also on the opposite side of the spectrum you get titles, that like to rubberband opponents to always keep the racing exciting and keeping you on your toes. Trailblazers seems to set itself in the latter category, and the rubberbanding on this title is at times entirely unfair. The reason I say this is purely due to the fact that with this being a team based game. Not only if you get unlucky enough that your AI team mate isn’t all that great or helpful in the race, you are going to run into no end of problems trying to keep up on your own by painting the track and taking shortcuts where possible. But occasionally when you do get a team mate that is willing to help you out and lay down paint on the track that you can boost upon, sometimes I would still see AI from the opposing team overtaking me, despite they wasn’t using turbo or had paint on the track that they could boost from. This to me made the game and especially the store at times entirely unfair and sometimes just purely luck based. When you have to get three objectives per mission, sometimes you will be lucky to get one and then if you redo the race you may end up getting all three with little to no skill involved afterwards. I would advise if you can to just play this title with a friend and getting rid of the AI team mate, whilst the AI on the other team may end up causing you headaches. You will still be having a far better chance of achieving something per each race with a real buddy to help you out. Featuring only twelve achievements, Trailblazers tries its best to cover all areas of the title whilst also adding a few misc achievements in for good measure too. You can easily achieve eight of the twelve achievements by playing against easy AI or none at all for that matter and choosing tracks that are easy enough to get the required credit on. Adding achievements for getting around Robo Ringway in under ten seconds or less add some fun and skill to the list that will take some time, partly due to the fact you will spend a good ten minutes of your life trying to set up the achievement by painting the track completely in your colour., Followed then by a further five minutes racing around the track at full speed, trying to get your angles correct enough to still get around in under the time frame. However the other four remaining achievements in this title are tied to essentially 100% the career mode and finishing all cups and which will easily take the most time in the game, however I found it difficult to find the momentum to keep going back and trying to improve my previous results in past races to care enough about these achievements. Trailblazers really could have been so much more, and just the sheer disappointment I had run through my body has I slogged my way through the campaign until I eventually decided I no longer cared enough to keep pushing through shows that. Whilst the game is totally serviceable for anybody with small children due to the brightly coloured graphics and cutesy looking characters, everything else in the game just seems to be lacking in one way or another. Be it just the sheer lack of songs within the title, the gameplay that looks so much fun to begin with before you realise is also broken against your favour, or the dull and uninteresting campaign. Trailblazers is one of those titles that could have been one of the best Kart type racing games the Xbox One has seen this generation. Unfortunately I feel this game is priced more than it should be, especially for the content included at this moment. If the price drops by around half of what it currently is then I would say give it a shot for the fun you can have within local co-op. But for now the game is in need of maybe a few more content packs.